The impetus for Rising Voices, a citizen media outreach project funded by a Knight Foundation News Challenge award, surged from the observation that the great majority of self-published bloggers, podcasters, and photographers featured everyday on Global Voices were highly educated, urban, and upper-middle class. 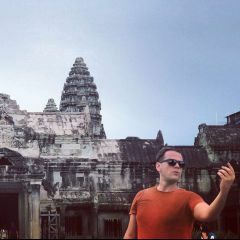 While the growth of citizen media has allowed for an unprecedented level of global connectedness, that network of new voices has yet to expand beyond the wealthy neighborhoods of urban centers across the globe. Until now. Thanks to the hard work of Rising Voices’ project coordinators, an international readership is discovering the local stories of previously unheard voices including young women in Dhaka, Bangladesh, motivated interns in Sierra Leone, and residents of the largely indigenous city of El Alto, Bolivia. Rising Voices, however, is much more than an initiative to bring local voices to a global audience. We are also interested in the potential of citizen media to create more unity in already established local communities. With this in mind, the facilitators and participants of HiperBarrio recently organized a town hall meeting which brought together over 100 residents and community leaders from San Javier La Loma, a hillside community which endured the brunt of the violence during Medellín's Esobar era and the subsequent chaos that followed until as recently as 2002. The event, which was to take place in La Loma's cancha acustica (the barrio's only public space), was moved to an auditorium in the local church when the afternoon's drizzling rain refused to let up. 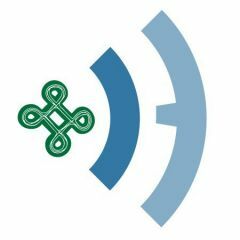 The Colombian digital magazine, equinoXio, published a four-part series about the unusual citizen media event with contributions from two of HiperBarrio's talented participants, Catalina and Julio Restrepo, as well as one of the facilitators, Alvaro Ramirez. 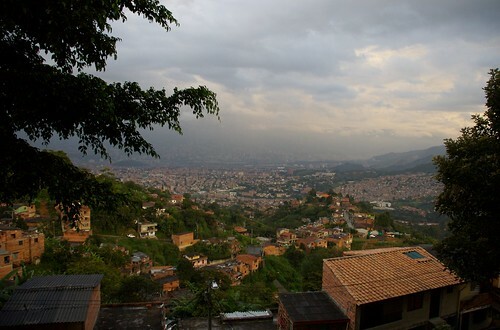 Their articles, two of which have been translated from Spanish below, reveal how HiperBarrio has brought a sense of unified community to what was once one of Medellín's most violent and most divided neighborhoods. Residents, local leaders, and special guests from La Loma and beyond gathered to experience the videos and photographs produced by HiperBarrio's citizen journalists. 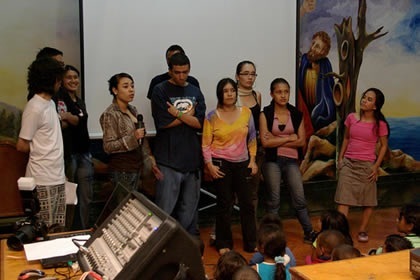 Six months ago the coordinator of the San Javier La Loma satellite library invited a group of its users to participate in a project aimed at rescuing the forgotten history of our neighborhood. At the beginning, Alvaro Ramirez showed us how to create a blog using the site WordPress.com, and since then the group has grown wings which today allow us to be known in many countries around the world and be part of the worldwide project Global Voices. Following the creation of our blogs, many trainers and workshop leaders have come to our neighborhood to teach us the tools in order to create audiovisual works (photography, video and audio), which we have used to tell the stories of the neighborhood he has seen grow up. First, to get to know so many people who have enriched us with their worldly ideas. The trainers have given us their very best as students, as professionals, and more than that, as individuals. Second, to discover the stories and history of our neighborhood, such as that of Suso, which has managed to touch the core of every member of the group. And third, the sense of unity that has grown between us as we go on our excursions throughout the community to document its history. Without any doubt a space of conversation has opened in La Loma, which has generated changes achieved by the young people who belong to HiperBarrio. We will continue in this project that has made us grow as people and we want to give our very best as members of a neighborhood and a city that needs more projects like this one. HiperBarrio's ‘night under the stars’ became a warm, cozy, and exciting encounter. We experienced some dramatic moments just two hours before the start as a persistent rain cooled the exposed hilltops of La Loma and the open plaza where we had planned to hold the event. The wind threatened to topple the giant screen where we were going to project video and the tree sculpture where we hung photographs and articles which the HiperBarrio participants have published over the past six months. We were saved by the Father of the parish who kindly let us use the communal hall adjacent to the church. We quickly set up the chairs and audiovisual equipment in order to start an event which not only brought the presence of over a hundred children, youth, and adults of La Loma, but also some important guests from inside and outside the community such as Jorge Melguizo, the brand new Secretary of Civic Culture, Gloria Ines Palomino, the director of the Library Network of Medellin, the local magistrate, the pastor, and the new commander of the local police post who took the opportunity to introduce himself to the expectant community. 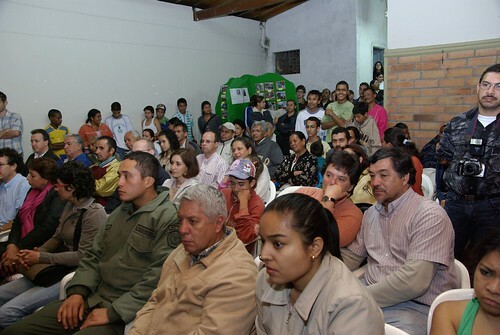 The event began with the projection of photographs of the community and surrounding area – with spontaneous snapshots of local residents, their houses, streets, and corners, as well as the previous vistas and landscapes of Medellin which can only be fully appreciated by those who come up to the privileged topography of La Loma. 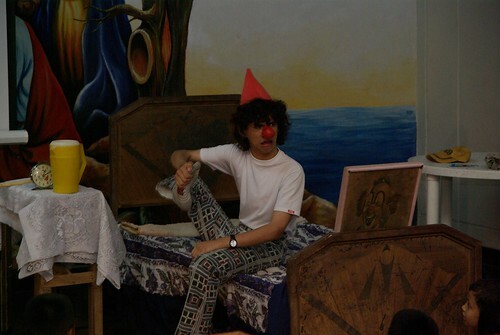 Milthon Araque performed a theatrical piece titled Sweet Dreams, Lilo which delighted all of the children. Then it was time to show the video productions including The Paniagua Family, Full Moon Nights, Rayones, and the powerful story of Suso. Those valuable productions not only show the history, living culture, and heartbeat of La Loma; they also reveal the creative talent of the directors as they continue their path toward becoming genuine citizen journalists. After sharing their works with the gathered audience, the members of HiperBarrio took to the stage and eloquently highlighted the exciting and challenging experience of learning to use the new online tools which have enabled them to self-publish on their blogs, equinoXio digital magazine, and on YouTube. Each participant received a long-deserved applause from the audience. Milthon Araque performing Sweet Dreams, Lilo to a delighted audience of children and children-at-heart. It was a beautiful and rewarding evening. I can still hear the voices of the kids in the audience: “It's the home of Rosa! Look, look, they also took a picture of my grandpa! Uy! That's up near Primavera, it looks good …” The children of La Loma gave small shouts of enthusiasm. Others, smilingly, whispered their comments to neighbors. Seated on the floor in front of the elders in the communal hall, they experienced this unforgettable public presentation of HiperBarrio, which has been documenting the everyday life of friends, family, and neighbors for seven patient, continuous months. There hard work has been feverish and they are now reaping the fruits, thanks to the cooperation of many people, especially the Biblioteca Pública Piloto and the metropolitan area Network of Libraries. HiperBarrio participants describe their experiences as citizen journalists. Indeed, with the continued support of the local library system as well as the Secretariat of Culture, HiperBarrio is now looking to expand its mission to bring citizen media to more of the many peripheral communities which climb up the hillside outskirts of the downtown valley. The current batch of 20 or so citizen journalists based in La Loma and Santo Domingo will continue to document the stories and histories of their local communities. But, in just a few months’ time, they will hopefully be joined by new peers who will also document their local stories for a global audience.